One of the must-have skills for fashion designers is the ability to create flat drawings in Adobe Illustrator – an industry standard. A flat garment drawing is a basic digital outline that shows what a garment would look like if it were laid out flat. It communicates your design idea in a technical format to be used by pattern-makers or manufacturers. Some skill with computer programs is an advantage. This course is designed to give an introduction to the Adobe Illustrator skills used in fashion design flat drawing. The course is suitable for dressmakers wishing to give realistic representations of garments to customers, young designers seeking to outsource production, and those studying fashion in preparation for entry level jobs. 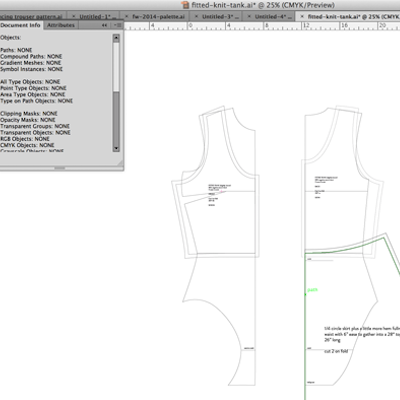 A technical pack is the documentation sent to a patternmaker or manufacturer to communicate the designer’s requirements for a garment and involves a proportionate illustration known as a flat, technical drawing or line drawing. The drawing is called a flat as it is drawn as if the garment was sitting on a table and viewed from above. It is a realistic representation of the silhouette, seams and design features of a garment. Students need to bring their laptop to class with Adobe Illustrator loaded. The program can be obtained for a monthly fee from Adobe. A textbook is used for this course as it enhances the student’s ability to practise outside of class. Details are provided upon enrolment. Practice and development of templates of garments that will be used by the students.